You can’t help but be charmed by the delightful Seth Lakeman. I first saw Seth perform at The Old Firestation, Bournemouth back in March 2012 and was captivated then. So, was very much looking forward to seeing him play live in a festival setting. And of course, thrilled to get the opportunity to interview him before he played to the Behind the Castle audience. Looking fresh and revitalised from a short break on the Isles of Scilly we settled into the wooden lodge or ‘press hut’ to chat all thing’s festival related and quite a bit about his van! 1. As we’re here at the first ever Behind the Castle festival, what was the first ever festival you played at? Oh, that was Sidmouth Folk Festival. I was about 14 or 15 and it was playing on stage my brothers Sean and Sam. The likes of Kate Rusby, Luke Daniels, Kathryn Roberts (Kathryn is now married to Seth’s brother Sean) were all playing. Yeah, we had a great time. 2. So, what would be your festival essentials that you wouldn’t leave home without? My van! Everything’s in the van that I need. It’s a TS Transporter, so it has a good sound system, beers in the fridge, wellies and a brolly. 3. Any advice to a festival virgin? *Seth laughs* – Get a van! 4. Any random or bizarre festival experiences? Having a stage-struck by lightning was pretty random. It was Middlewich Folk Festival, there was heavy rain, the stage was wet and then it was struck by lightning and the power went down, everything just stopped. CBC: Wow, these days with Health & Safety they’d probably have stopped it with torrential rain. Seth: Well, as they say ‘the show must go on! 5. If you had the opportunity to curate your very own festival who would you invite to play? Who would be your headline act? Well, it all depends on how much money you have for your acts, but it would have to be Frank Turner. And I suppose my old man Geoff! We did look into this a year or so ago, we were going to hold it at Morwellham Quay in Tavistock, Devon, but then the twins came along! It’s an old mining village that would hold 1,500 people. It’d be like stepping back in time, very unique. We’d have a mix of folk music, crafts and food. 6. What can the audience expect from your performance later today? It will be the 5 of us up on stage and probably about 6-7 songs from the album Word of Mouth and of course lots of dancing. Camping or glamping? Glamping. With the van! CBC: I really should have asked to see this van, Seth lit up every time he mentioned it! Must be a man thing? Wellies or flip flips? Flip flops. Where will we find you during the festival: moshing at the front, dancing in the middle, chilling at the back or at the bar? At the bar! Posh loos or hole in the ground? Posh loos of course given the choice. Favourite castle? Sherborne Castle. I was reading up about the castle on the way here and didn’t realise it was built by Sir Walter Raleigh. How great is that? Also, Lydford Castle is one of my favourites. And finally, can you sum up Behind the Castle in 3 words? Ooh… Happy and content. Or how about ‘The summer’s alive. CBC: Seth says with a huge grin and you know it’s going to be a great set that evening. 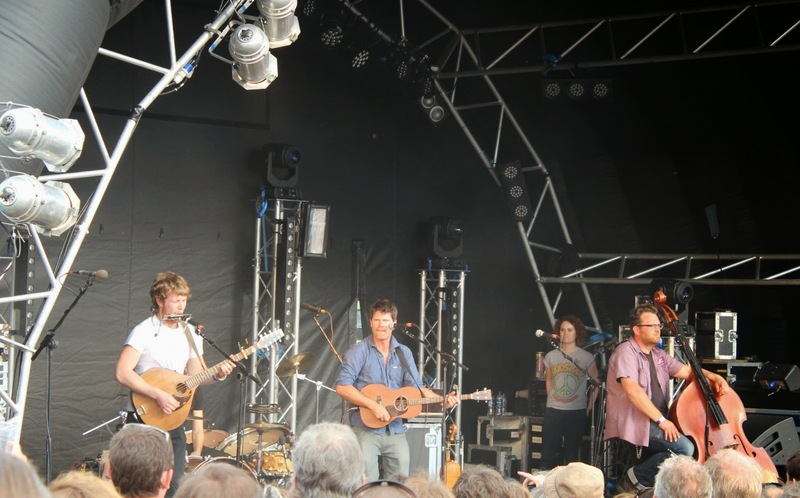 Check out my post from Behind the Castle festival and read my review of the festival featuring the talented Seth Lakeman’s set. You really can’t help but warm to Seth Lakeman, not only is he a very talented folk musician, but he’s a genuinely top guy that you wouldn’t mind kicking back and having a pint of cider with at the bar. Check out my interview with Cara Dillon – who’s married to Seth’s brother Sam on the blog.